In economics, personal debt, often referred to as consumer debt, is a loan taken for consumption, not an investment, in the business. It is often used to purchase goods which are consumables and do not appreciate in business. When a financier or a financial body gives a specific amount of money to the borrower, this money is called debt. Debt is created by the borrower who will have to return that money lent to the financier. Debt is also called a loan. There can be different types of loans. The person or entrepreneur who owes debt is a debtor and to whom this loan/debt is owed, is a creditor or lender. Debt can be issued either to an individual borrower or to a business. Personal debt is taken by the individual entrepreneur, not by the business and/or corporation. Debt is taken by an entrepreneur to use in funding huge purchases that he/she could not afford under normal conditions. A debt arrangement means that the borrower is given money under the condition that he/she will pay back the money at later dates and, most of the time, this is paid back with interests. Whatever the business is, money is required as an investment to get a business started. Even if the business is a one-person business, in the beginning, it still needs money for registration of the name, logo, tools, work space and a computer for running the business. Even the smallest business requires money for a good start-up. If the entrepreneur does not have enough savings or the business operating expenses may grow beyond the revenue, then it is obligatory to take a loan to invest in the business. There are many options to attract potential investors but, if there is no evident system of revenue in the business, the banks may not give the loans. In that case, entrepreneurs have an option of going into personal debt. Here are some important rules to be followed by entrepreneurs going into personal debt. 1. Personal debt must not be taken as the first choice. First, consider all other options available at that time to invest money in the business rather than taking a personal loan as the first choice. Review the business plan and bookkeeping. 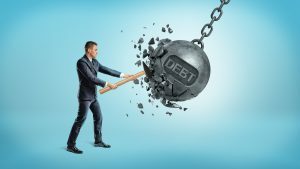 Clearing these issues will make the business plan more appealing to potential investors, which can further decrease the chance of going into personal debt as an option for the entrepreneur. 2. If the business is of small size, then go for loans offered by the government which are provided with the least interest rates. 3. Get rid of any current debt first. Remove previous debt as much as possible before going into a business that will need more loans. 4. Have a clear-cut idea of what a personal debt is. Even though you are using this loan for your new business, going into personal debt is a personal loan. You have to pay it back yourself. Though you might be investing the lent money in the business, paying back this loan with interests is your liability. Many businesses do not generate remarkable profits for years. If the business is new and not already a successful running business, then the fact that the business could go under must be kept in mind. 5. Get personal loans at the best interest rates. Try searching for better interest rates, which are more feasible for an entrepreneur to pay back the loan rather than taking on much higher interest rates. 6. CrowdFunding Option: In this case, large masses of people are asked to invest small sums and a huge capital investment is created. 7. Always have a backup plan when going into personal debt. In case a business fails or does not yield enough profit to pay back the loans with interest, the entrepreneur is personally accountable for the debt taken, no matter what. Personal debt is a good option for entrepreneurs for investment in a business plan, but always consider all other options first. Always have a backup plan if the business fails, as the entrepreneur will be personally accountable for paying back this loan.